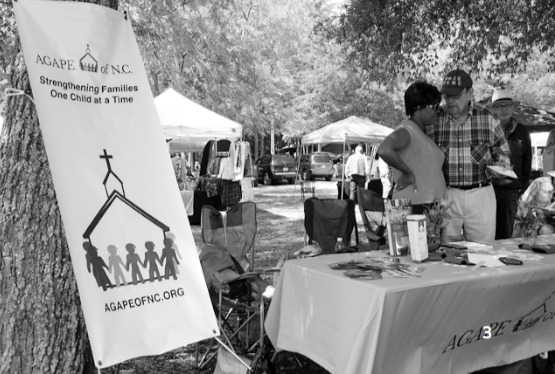 AGAPE of North Carolina offers a lot of impactful programming for youth and families, and we would love to share more information about our organization with you! In March 2018, we were pleased to attend the Southern Women’s Show at Wake Technical Community College and connect with women in the Triangle area. We were excited for the opportunity to outreach more recently in western North Carolina. Early in June 2018, we were able to speak with members of the Abilene Church of Christ in Statesville. We appreciate the opportunity to meet with people and have important conversations in person. As we increase our efforts to recruit potential foster families and spread the mission of AGAPE, we would welcome the opportunity to share our message with similar organizations. For example, later in June, we’ll be visiting with members of the Kannapolis Church of Christ. We will also be participating in the annual Juneteenth celebration in Durham on Saturday, June 16. If your church or community organization would like to hear more about AGAPE and our mission, please contact us! Call our main office at (919) 673-7816, or e-mail our office manager, Kaye Orander (korander@agapeofnc.org) to discuss the opportunities for partnership. There are children in need in our area, and we believe our community can join together to positively impact their lives.